Did some camping a couple of weeks ago. Went out east to camp with a bunch of friends. It was Cold but the trailer and fire was warm. I made ribs for dinner one night and London broil another. On saturday Jinny and I went shooting and at night we had a Rocky Horror Picture Show party an pumkin ale tasting. After a few tastings one of the girls fell while dancing around the fire. On Mondya she found out that she broke her ankle. She"ll be OK though. Hear is a picture of the beer we sampled. 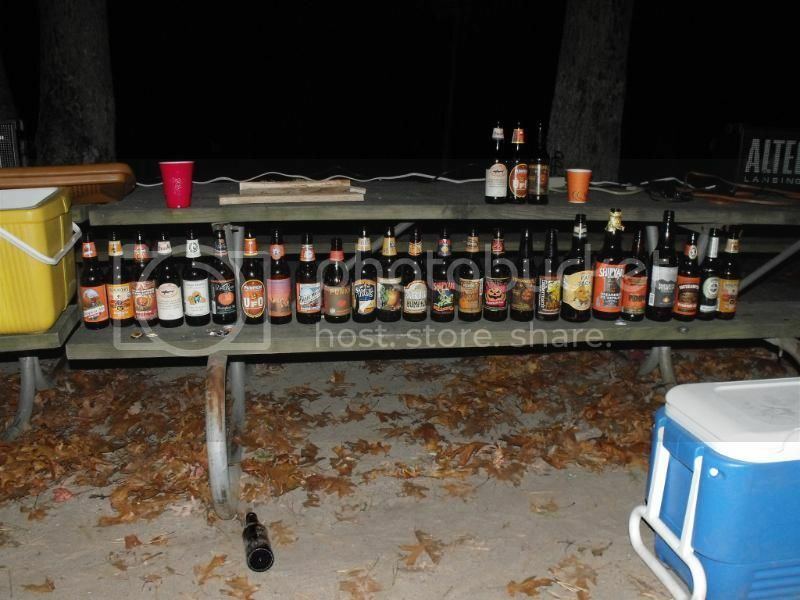 Camping, shooting and drinking beer. Well... it just don't get any better than that! Did you save us any of those beers Bo? Looks like you folks had a real good time! Speakin of drinkin, it's past noon! All beers were consumed. But I do recommend the Shipyard Smashed Pumkin Ale. With a name like that, it has to be good.